How wonderful it is to be able to run that headline! Kate has announced a series of live dates in August and September at London’s Eventim Apollo, Hammersmith. This venue is the Hammersmith Odeon as was, where the Tour of Life ended 35 years ago. All details below, and we are gathering ALL the news and press reports in this post below also. “I am delighted to announce that we will be performing some live shows this coming August and September. I hope you will be able to join us and I look forward to seeing you there. We’ll keep you updated with further news on the web site. Meanwhile, all details of concert dates and tickets are in the note below. AUGUST: 26th, 27th, 29th, 30th. Please note that tickets are NOT available from the venue Box Office. Ticket purchases are limited to a maximum of 4 per order. For example, you can try to purchase up to 4 tickets for just one of the 15 concerts, or 4 tickets for 4 separate shows. Please particularly note the ticket security and resale measures: the name of the lead booker will be printed on the first ticket. As the number of tickets is limited they will be allocated on a first-come first-served basis. Tickets cannot be resold or transferred under any circumstances. The promoter says: The lead booker will be asked to present ID to gain entry into the venue. Failure to adhere the terms and conditions may result in the customer’s order being void. There are no exceptions to this rule. Demand for tickets is likely to be enormous. Gigwise estimates that the demand will be greater than for recent gigs by Beyonce and Lady Gaga. Here’s Seán Twomey from this very site being interviewed today on the Mark Radcliffe show on BBC6 Music! This entry was posted in Before the Dawn - Live 2014 Shows, Kate Bush news. Bookmark the permalink. Wow. This has to be the most spectacular news I’ve heard in ages. If I don’t get a ticket I’m going to be devastated… Totally love that it’s made headline news all over the interweb. Brilliant! How on earth am I going to be able to get tickets?? ?It’s going to be impossible!! Glad you also managed to get tickets, kaybee. I did too, thanks to the pre-sale arrangements… other friends who didn’t have a code but tried on Friday morning weren’t so fortunate. You replied to an earlier comment I made, about possible set list for the show. The day after the concerts were announced, a message appeared on the official Kate Bush website, explaining that the promotional image referred to work dating from 1985, and that the photos had been produced months before… this message was removed later the following day, strangely. I expect the coming months will be very demanding for Kate herself, but I hope she looks forward to the experience, even just a fraction as much as her fans do should be enough to sustain her! There will be much pre-show excitement, so many joyous fans inside the Eventim Apollo, that will itself make the concerts memorable. Utterly thrilled! What exciting news and good for Kate to sneak that out of the bag to an unsuspecting public. Two albums in one year, now playing Live! Beautiful pics! excited to see that there may be some reference to The Ninth wave? Absolutely HAVE to secure tickets! This is the show of the 21st Century! this sure feels like a dream! Brilliant! Who says good things don’t come to those who wait? At first thought this may be just a tribute act,can hardly believe it! One show would have been amazing,gives many a chance to fit it in! Absoulutely awesome news! I’m a bit away but will certainly come down to London to see Kate! Of course won’t be easy to get tickets but hope I’m fortunate! I know someone who’s saying he’s already got tickets weeks ago through Ticketmaster VIP. Is that possible?? We are contacting you as you are eligible to participate in the fan pre-sale for the “Before the Dawn” concerts in August & September 2014 at Eventim Apollo, Hammersmith 48 hours ahead of the general ticket sale on 28th March 2014. I will be getting married on 20th September, me and my partner met because of our love for Kate, what an amazing wedding gift for us to see Kate live just before our event. And now to start mission impossible. Figure out how to get a ticket from here in Oz… Such great news guys. The same…attempting the impossible for a ticket, then if lucky, sort out the trip of a lifetime. Good luck! So long since the KaTe Kon. It was an awesome time wasn’t it. Now I’m going to try and do it again. First trick is actually getting tickets. If that works out then it’s UK here we come again! This is going to be great. Something good is going to happen. G’day and goddag! The glory of the world wide web – only a seconds apart, aren’t we all? This is a blast! But oh yeah, first we must get across the hurdle of hurdles come Wednesday when thousands of Kate devotees sit at their computers (like a friend), fists clenched, cold sweat springing from their foreheads, all piggy banks emptied and then …. MELTDOWN. Come Thursday, we’ll see who goes and when. The sheep will have been separated from the goats. Bah! Baaaaah! And dream, dream, dream … of sheep. Just before “50 Words” was released, I thought, “She’s not going to release another album, people! She’ll be fiddle-farting around in the studio for another couple of years yet!” Last week, I was thinking about reactivating my forum ID (I’ve forgotten the password and no longer use the email address it’s attached to) just so that I could be a contrarian and say, “maybe not performing live is a good thing. After all, her most recent stuff is 15 minutes long, and I’d hate to condemn such an original to a nostalgia act.” The only sure thing about Kate Bush is that she’ll do the opposite of what I expect. Lots of moaning and groaning about not leaving London, though. (The negative, anti-London bitchery on the “Guardian” website was something else. It was like going to Western Canada and saying that you’re from Toronto–or worse–Quebec!) Staying in one place and testing the waters actually makes sense to me. For one thing, she probably doesn’t have the stamina she had 35 years ago (who does?). For another, it makes sense for someone who hasn’t performed for years to do a little “tester” to see if people show up, and see if they like the show. Most stadium shows are sponsored by Coke, Pepsi or the lot. Any independent artist who wants to call her soul her own might invest her own money into it. If she does, she’s going to be careful about venues, number of shows, etc. just to see if she can draw a large enough audience to continue. Performing has a lot of hidden expenses that people don’t always think about. Good Luck to everyone on the sale day. Let’s hope the tickets find their way to fans only, and not money making profiteers. Touts and profiteers are going to have a hard job with the ticket security on this one. The original purchaser will have to show ID on the door. Good to know. That’s such an excellent idea! If you come to America after you are done performing in the UK, I will give you milk and cookies. Or a nice hot pot of tea, if you prefer. How sweet Harry. Yes, I would like Kate to perform in America too (particularly New Orleans) but let’s face it, it’s probably never going to happen. Maybe in New York but I highly doubt all 50 states would get Kate. I hope there is a DVD of this tour and I hope these shows don’t mean the end of Kate’s journey. I mean…retirement? Anybody else worried that this could be Kate’s last hurrah? Not really. You’re only allowing yourself to be sucked in by other overzealous fans and their illusions of what they personally think. That’s how rumours get started and begin to spread. Soon this will be known as ‘The Retirement Tour’, and people will believe it. Now that’s the real power of the internet. This is the best news! I am overjoyed by this news. I have dreamed of seeing Kate live for so long….35 years. I have been taken with her from the first time I heard her. I did get to see her first on Saturday Night Live way back in time. I have been hooked ever since. Thank you, Kate, for bring such light, amazement, and delight into my life. I so wish I could come a see you. But alas I live in the States with a little one on the way. Best wishes for you are you venture into these waters. You will blow people way, I just know it! This is THE announcement of the new millennium! Thank you Kate! 85% of the UK population don’t live in London! This is so exciting. And I have just had a special fan only pre-sale code for tickets 2 days before 28th, so all loyal Kate Bush fan will get first pick. I think they are really trying to look after true fans this time. Everything crossed we can all get tickets and enjoy something unique and very special. How did you get the presale code for tickets? Was it an email? I live in the US, and have never visited the UK, but now I seem to have the perfect excuse. I’ll gladly cross the pond to see Kate! Assuming I can get tickets, September will be magic! This is SO exciting, I’m almost lost for words. What a wonderful surprise. I hope to get a ticket – following Kate and her music from 1978, I’ll probably be so overjoyed at the gig I’m going to cry like a baby. HG team, it seems you will just have to start to plan another book soon, don’t you? She will keep you guys busy 😀 And us all. Yes! Happy Day – Always been hopeful, but for that wishful thinking to become reality is something else! According to one news story off the internet, she is outselling Beyonce, Lady Gaga and Katy Perry. I would not be surprised by tommorrow morning no tickets would be available if the tickets went on sale today March 20, 2014. Its a funny thing about performing, I create music on the piano and people tell me that the music is great, loved every minute of what you play—-constant good reviews. I played at a church last November in Pittsboro and it was so simple just getting up in front of the audience and performing a five minute piece. Only about a 2 or 3 minutes of initial anxiety. No stress at all if one is in the right mindset.They all liked it, they just said it was great and wonderful, got fans all over the place, which I hardly pay any attention too, though they are really nice people i am just another person out here, nothing more struglging with the same issues others do. .When performing, I did not make the mistake of infusing my ego into the preformance (thats very important! )—keeping it light and floaty, is the trick to performing with that mindset, and everything goes off without an unneeded stress– I don’t like performing all that much any way—I rather like creating music. But it was kind of funny I just got up in front of about hundred people & played the piece and that was it. While playing the piece, I was thinking who was on the TV playing basketball, state or Carolina. That was the only thought I had in my mind playing the music and an hour later I was with some friends watching basketball with hardly a thought about the concert I gave an hour earlier. I was talking to a friend last month about the NFL football teams in the US. Tickets go for 800.00 a seat in some cases in Dallas for the Cowboys. 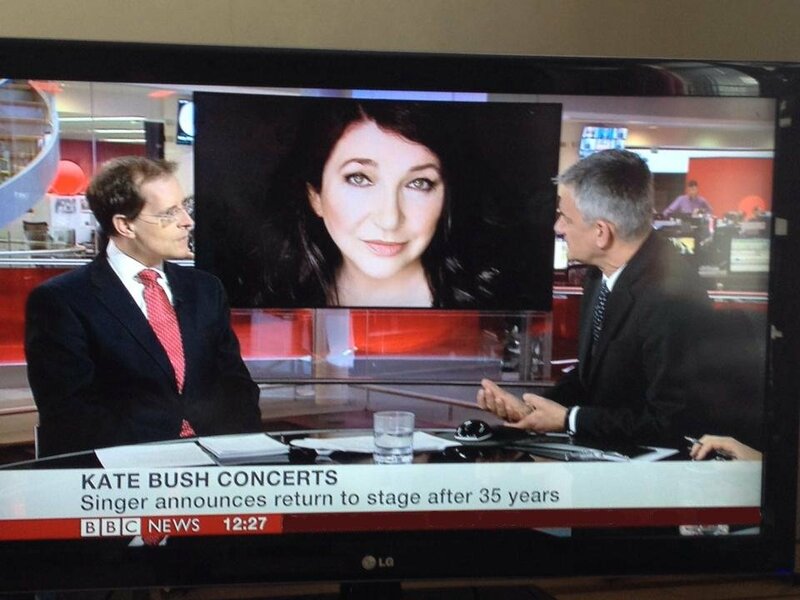 I bet Kate Bush could fill up several football stadiums in the U.S. Even at the Univeristy of Michigan at Ann Arbor, a non professional sport stadium, the seating capacity is 102, 000. Tickets ranging from 30.00- on up to the real pricey 800.00-to-2,000.00 range would leave all these options for a sell out’ in all stadiums and venues.. I bet she could easily play twenty to thirty U.S. stadiums and indoor arenas, if she can keep the thought of performing light and not infuse ‘too much choking off perfectionism”—- into the preformances. Leave that for creating the music. Plenty of latitude exists for having the prefectionism around & about when alone in the studio or at the piano.In any case its great great news for her fans. I think she would do well in America but I’m not sure about stadiums. Oh my god! I am sitting her shaking while reading this news. I can’t believe it. I had a dream one year ago that I was at a Kate Bush concert. It felt so real to me. I must get a ticket! I live in the U.S. Looks like I’ve got some planning to do. Has anyone received an email invite from kates website inviting them to a preticket sale on wednesday morning at 9.30 am – it gives a code number to enter there as well when logging on to buy tickets. I have received this to my email address on my mobile phone but not to my email address on my pc and was wondering is this genuine as it seems so too to be true? (I really hope it is genuine though)! Yup. Received this as well. They will be restricting new online members as well so that really only those who’ve signed up before March will receive this purchase code to buy BEFORE the tickets go on sale to the general public!!! This evening I’ve been trying to imagine a setlist… even if she performs only two tracks from each of her studio albums, that would be a substantial live show. And her back catalogue is so rich – can you imagine having to pick only two songs from ‘Hounds of Love’ or ‘Never for ever’? 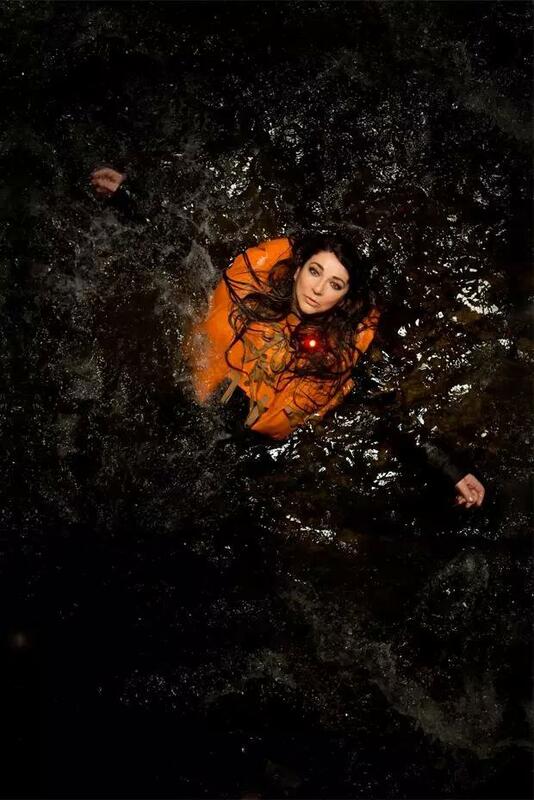 The promotional image for the tour, which features Kate in a life jacket, floating in the sea, suggests to me that ‘The Ninth Wave’ sequence from ‘Hounds of Love’ is going to feature significantly. I recall years ago reading on another fan website that there had been rumours that she’d considered a tour around the time of ‘The Red Shoes’ which would feature all of ‘The Ninth Wave’ tracks performed in sequence. They form a narrative of sorts, ending with ‘The Morning Fog’ – again perhaps ‘Before the dawn’ is a clue? I’d love to hear those tracks, but equally I would love a performance of Aerial’s ‘Sky of Honey’, another sequence of tracks which concludes at dawn. Oh my, how on earth will she choose? Like you, I’d be happy whatever she does, I love all of her work. Since my own favourite albums are ‘Aerial’, ’50 words for snow’, ‘Sensual world’ and ‘Hounds of love’, I’ll be ecstatic if she focuses on her ‘later’ period. Having said all that, Kate obviously enjoyed the process of re-inventing tracks on ‘Directors Cut’, so perhaps that led to some inspired ideas about how to re-formulate earlier work. The only things we know for sure are that 1. with Kate, expect the unexpected, and 2. whatever she does, it will be beautiful, and 3. her fans will love it! Sean, I’m replying to your post below about a new msg on katebush.com about the ninth wave because I can’t find the msg on there. Do you have a URL, please? 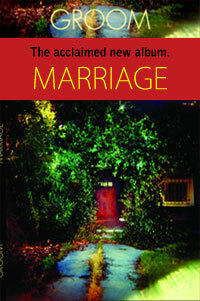 The earlier message referred to the image used in the promotional materials. It stated that the photographs were taken several months ago and referred to a song sequence that had been written back in 1985 (these sentences I cut and pasted into my earlier posting) and concluded with an apology if anyone found the image upsetting in view of the tragedy which has featured in the news in recent weeks. This event is for fans only and the following rules are in place to ensure that tickets do not get sold on and fans do not pay a higher price for their tickets. Ticket purchases are limited to a maximum of 4 per order. For example, you can try to purchase up to 4 tickets for just 1 of the 15 concerts, or 1 ticket for 4 separate shows. All tickets MUST be purchased in the same transaction in order for the access code to remain valid. The name of the lead booker will be printed on each ticket. The name cannot be changed once the booking has been made. The lead booker will be asked to present ID to gain entry into the venue. Failure to adhere to the terms and conditions may result in the customer’s order being void. There are no exceptions to this rule. If you are booking more than one ticket your guests must arrive at the concert at the same time as you. Failure to do so will result in the guests being turned away. As the number of tickets reserved is limited they will be allocated on a first-come first-served basis. Sadly this means that not everyone receiving this offer has a guarantee of securing a ticket during the pre-sale, but anyone who doesn’t manage to get one will still be able to try again when general tickets go on sale at 9.30am 28th March 2014. Any chance of you getting in touch? I think the Tour of Life website needs some updating! I burst into tears. Supposed to drive my kid to his student job–he looked at me and said Mum you can’t drive. Can’t type either. My husband has come home at lunchtime to be with me. Will be coming from Canada. Incredible news. Utterly marvellous – and equally unexpected – news. Great for Kate. And, of course, like anyone reading this I’ve never wanted tickets for anything quite this badly. I hope everyone who’s lucky enough to go have a fantastic time. Ecstatic at hearing this wonderful news!!! I just hope all us true fans and devoted followers of Kate’s music manage to get tickets. Good luck Kate! So God exist! Ohh, i’m so thrilled!!!! just when I thought we would never hear from her again. She surprises us all, Now for the planning of this epic event. I have to go. Mother of god. I’m still in shock. The event of a lifetime. Thank you, Kate. I’m still in shock! !, being only 9 when she last toured I honestly thought I’d never get the chance to see her live! Looks like they are really trying to look after the fans too as I also received a codes for purchase 48 hrs before tickets go on sale and their only to sending to anyone who registered on katebush.com before 1st march so should keep the money makers at bay! Just hoping the code thing is genuine and will be waiting for 26th with baited breath and everything crossed to get my tickets!! This is soooooooo yesterday. I’M KIDDING! I f-d up. I thought I was on the list and I’m not, so I’m hoping someone will take pity on me and drag me along with them on Wednesday, so to speak. It’s still great news though. I think Friday will test that booking-site though, they have no idea just how many hits they’re going to get. Good luck to all in getting tickets – as we know, magic can happen. LET’S PARTY LIKE IT’S 1979!!!!! I THOUGHT IT WAS A FREAKIN’ JOKE AT FIRST!!! KATE’S RETURN TO THE STAGE IN 35 YEARS!!!!!!!!! KATE, I’VE BEEN YOUR FAN, ADMIRER, ADVOCATE AND DEFENDER OF YOUR MUSIC FOR 35 YEARS. THANK YOU SO, SO MUCH FOR COMING BACK!!!!!! To Beyonce, Lady Gaga and Katy Perry: TAKE NOTES!!!!! What a day! Never thought I’d see this happen! I had a suspicion that the Vernal Equinox would bring a new album announcement, but not live shows. Calculator time! Can I or can I not put the airfare together? Must figure that out by Wednesday a.m.! Cheers everyone, what a fun and happy day this has been! Big kisses and hugs to Kate and Kate fans. This is an extraordinary day. I wish I could go: but just saying it could even make it happen. I honestly thought this day would never come. It’s surreal actually. I’ll be hitting the fan presale, and if I get a ticket, I’ll be coming from Dallas to see Kate. I’ve dreamed of this moment, and never thought it could actually happen! I am so excited for everyone who will have the opportunity to see Kate in the flesh! Unfortunately, I live on the wrong side of the planet, and it would cost me $2000 to see her. Had I been fortunate enough to live on the correct side of the globe, I would indeed be a happy woman this evening! Out of the Symphony In Blue comes Kate Bush with not 1 but 15 shows & the whole planet goes into meltdown. Our Kate is a trickster. How was this kept a secret. WoW. I’m amazed & a few thousand kilometres from Perth, Western Australia to Hammersmith, London is only a short walk for this mind blowing event. I will do my utmost to get there. 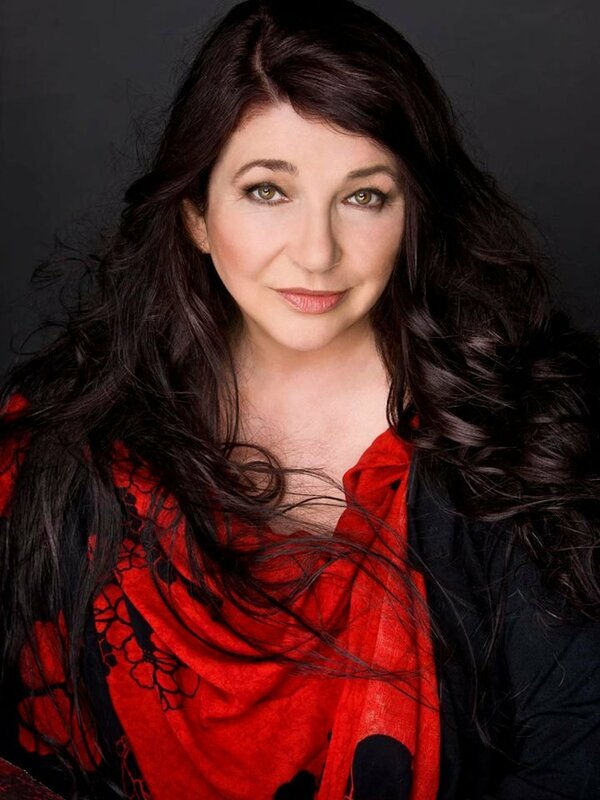 With all the demand for tickets, the answer and resolve to the issue of everyone getting a chance to see Kate Bush perform live, is to have Kate Bush play an outside pasture or field concert, like the Bonnaroo music festival in Knoxville Tennessee area. At least 100,000 (most likely much more) people were able to attend a Bonnaroo festival. On the internet, typing in Bonnaroo and then going to the area on the opening page: ” images for Bonnaroo,” the images that are related are depictions of the number of fans that attended the concert. Paul MCCartney played that venue in the summer of 2013. Acoustics may not be ideal as for an opera house, concert hall or even indoor basketball arena, but a very good sound can be accomplished with that type of concert. 5 Kate Bush concerts in a Bonnaroo type of venue would most likely satisfy the demand for seeing her live. Somewhere in England. You could even construct your own type of musical stage out of nowhere in the countryside that is, that would guarantee the accomodation of the largest number of fans attending. That sounds beyond ridiculous. Kate Bush’s music doesn’t translate to this type of venue. She’s not bloody Oasis. Hope to see Kate, Paddy, Del and John on stage in september! Wouldn’t it be wonderful to see Syd Arthur as the warm up act too?? i still can’t believe this news. just hope can get a ticket I’ve been a fan since 1978 when i was 7. Its been a long wait. I would have been less surprised if Elvis had announced fifteen live shows. I second that! All the adoration and excitement and media attention, it’s thrilling for fans whose dreams have just come true, but I can imagine it might well be a nightmare for those in the eye of the cyclone. I do hope Kate manages to enjoy the experience of the next seven months! This woman is always good for a big surprise, but this time she scares me to death. Is it really true, -and will I get a ticket?? OMFG I have to get one!! Have to laugh when im reading some of the garbage that’s being spouted by press at moment.The reclusive star,the fear of kidnapping stories the reference to Withering Heights as though shes done nothing since then…lol. If news was only announced a week later on April 1st would have been best April fool ever! Just booked my flight from Sydney. How could I not! Not knowing what concert you may get a ticket to, if at all. Don’t you think thats a huge risk? I need to find ANOTHER Aussie fan to talk to about KB!!! Hey guys!! Please join the below event and let’s get Wuthering Heights back to number 1 to mark the big occasion!!! Share with your friends in the UK too! WE CAN DO THIS!! Wish you all the luck with this! I live in upstate New York and also have the pre sale code. To increase my odds, I will try to get tickets for one of the middle shows. I was wondering if anyone who perhaps lives near me would like me to get them a ticket, too? I don’t live in NYC, but if you get through to the sale and are not buying the maximum of four tickets, I would happily buy one from you, and I promise to get the money to you before you need to pay it back to your credit card co, and to meet you before the show at a time/place to suit you. I am not going to offer you extra money, because I would not want that to be your motive, but I will offer to pay the same again, as the face value of the ticket, to a charity of your choice. I extend this offer to anyone else using a code and not having a home for all four of the ticket allocation. But I only need to see the show once. Please let me know, because I will be trying very hard on Friday morning on the normal sale..! Managed to get two tickets Joe. Absolutely made up (even for a Friday, which helps travel/work-wise). Totally delighted! Thanks for the sentiment. Enjoy. All those that have code ..you lucky lot! I was so pleased when I heard the news on Friday morning, I think my heart might have missed a few beats! Since then i’ve started to feel more and depressed about my chances of getting even one ticket to any show. I’m a long term fan (since I was 15 i think) and I’ve bought every new album on release day, plus regularly checked this site and others. I wasn’t signed up to the Fish People mailing list (didn’t realise there was one) and so haven’t got a pre-sale code. I was thinking of enlisting some help from my family to get on their computers on Friday morning and try to help me get a ticket, but apart from that I don’t feel like there’s anything i can do. Does anyone have any good ideas of ways to increase my chances of getting in to a show? It’s not like my world would be over if i didn’t get to go, but i would feel profoundly sad to miss an event like this. Like, I’m sure, everyone else who has commented on this post I feel that Kate’s music is more than just a background noise in my life. During times of vulnerability, contemplation and celebration her voice, lyrics and music have been there to help make sense of everything and in a way I am the person I am today because of years of listening to her music. I’m a father of two girls (both very young) and I play them lots of Kate. They will definitely grow up knowing exactly who Kate Bush is whether they grow to like her music or not. One tip that you might also have read elsewhere is this: Make sure you log on to the eventim site (and the sites of the other ticket sellers, too) and create an account before you place your order. That way, you won’t waste precious time typing your details – which might result in the timer running out so that you lose the tickets selected. Also, make sure that your credit card payment will clear smoothly with your bank – notify them in advance if necessary. Security measures to catch potentially suspicious transactions can be a real pain here; I myself had 20 very scary seconds before the “verified by Visa” security thing (where they send you a text message and you have to enter a code) went through. I was glad I had my phone ready. 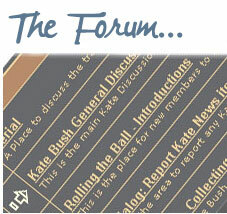 I was registered on the Kate Bush site with an old, now defunct e-mail address. (Which I have to confess means I haven’t logged in since 50 Words was released) but also means my e-mail with the presale code has been sent to an address I can no longer access. If anyone gets through on the pre-sale day and is NOT contemplating getting four tickets, please add one for me, and I will buy you dinner beforehand. I’m in France, but will be able to get to London for any of the concerts, I can promise to get money to you before it’s off your credit card, and I am a very loyal fan and have been for a very long time. Of course if anyone has a code and cannot use it because of being too far away or something, I will donate £200 to a charity of your choice for its use. Still finding it hard to concentrate on work or indeed, anything for that matter since this news came out. One of the best pieces of news I’ve heard in my lifetime. So decent of Kate to make the effort to ensure that a) touts won’t be able to buy most of the tickets on Friday by making people bring id with them, and b) making sure tickets are available to fan club members…. Very interesting to hear much of the idea of the concert at least may be based around the Ninth Wave from Hounds of Love album. I’ll never forget how blown away me and all my friends were in 1985 listening to that. I used to listen to it alone too, with my headphones on in bed listening to all the “strange” sounds and trying to understand the lyrics, not to mention trying to take in all the special stereo effects in there. The way it was crafted together so that all the songs effortlessly blended from one to the other…. Still, hoping there’ll be plenty of stuff from all her other works of art too (which her albums clearly are). This Woman’s Work, Moments of Pleasure and Sympony in Blue are just 3 I would love to see..oh, yes and Army Dreamers….perhaps Mrs Mop will even make a come-back as well…. (that’s my wife’s favourite video-performance of Kate). 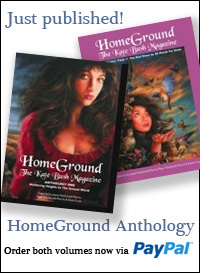 Best of luck to all and a big thank you to all the guys at Homeground who have done so much over the years to keep the likes of me in the news about Kate…. Hey! I’m in New York City and I’m DEFINITELY going, that is, if I can get a ticket. Unfortunately I don’t have a presale code. I would appreciate any help you can offer with this! Ideally I’d like to hit any/all shows during the first two weeks of September. @Ed: See Decimus, six comments up. I’d recommend to others sharing your e-mail so you guys can contact each other. I wish I could offer but I don’t have the money available, ie. am using someone else’s credit card already. I sincerely hope the best for all and echo Steve’s sentiment: Thanks eternal goes to Seán, Peter, Krys, and Dave. You are little lights shining. I really, really hope the website can COPE with all the pre-sales people looking at 0930 on Wednesday. I notice you have to select a date and then enter the code which will only work ONCE – so what happens when it times out or the date you have looked for has no pre-sales tickets left? It’s so common with big events that the website just can’t handle it. I’ll be gutted if I type my code and it times out and then I can’t get a ticket! As has been pointed out there must be many more pre-sales people than tickets in total – so I wonder how many tickets are actually going to be available. I was in shock when I read the news, I just couldn’t take it in. I get chills just thinking about that moment when she steps out on the stage…how people will react to her. I now wonder what to do..buy four tickets and just go by myself all the way from Scotland to see four shows, or donate two of them to non-Kate friends so I only see two shows but have some company in big scary London? All presuming I get any tickets at all of course! Tomorrow morning my hands are going to be shaking all over again as I type in my pre-sale code..
Hope you managed to get tickets, Andrew – you won’t be the only fan travelling down from Scotland, I managed to buy tickets for Wednesday 10th September, I’m overjoyed! Shall we start betting on opening song? I think I’d go for The Sensual World. Is anyone else nervous about using their code tmrw morning?? I think i read that if i refresh my browser or go back in my browser it will be invalid so im a bit nervous and want to be 100% sure i am doing the right thing! Will we be able to make selections for seats on different nights on the same screen? i dont get the impression that we can make a second purchase so i dont understand how that will work if the code is a once use only and looking at the options on eventim.com at the moment it looks like different dates have different purchase screens. Or are we adding tickets to a basket then checking out when we have as many tickets as we think we’re going to be successful for?? I didnt think this was how it was going to work as i thought i read that the code would have to be entered up front not at the end. if there is no availability on one of two dates i try for am i successful for the date that there was availability on or do i have to try the whole process again as if it was a new selection?!! Does anyone know?? oh my God, Stress levels are rising.. I am wondering the same thing. I have been trying to practice on Eventim’s website. Once I have added the first ticket it allows me to go out and find other shows but when I try to add another show I get a message saying that I must remove the other show first. Any help with this would be greatly appreciated. Does anyone have any experience with this? WHERE is this “fan pre-sale drop down menu” located on the site???? I don’t see it anywhere- or will it appear once the tickets go on sale??? You are not the only one, stress levels are rising as the moment comes closer by! Your questions also came up to my mind when I prepared for today. We’ll have to experience it ourselves and keep our fingers crossed to see Kate! Good luck to everyone, hope it will be your moment of pleasure! All theoretical for me, since I’m in Toronto and can’t afford to attend. Good luck to everyone posting here! I don’t know the answers to your questions, Glenn but I know how you feel! I haven’t had a decent night’s sleep since the news broke! Nervous/excited. thanks kaybee it was only a little confusing at first as there was a prompt for the code with enter beside it yet underneath it said show not on sale, i didnt want to risk hitting the button for a while and froze! but it was well organised once you did enter your code i have to say, got two great stalls seats for 16th! best of luck for you! Thank you Glenn – I got 2 tix for opening night- eventually! T I C K E T S !!!!!!!!!! Tickets confirmed and on their way. I’m in a state of shock… am I REALLY seeing Kate Bush?!?!?!?! 5:30 am and I need a drink!!! I logged in at 0930 and it was a breeze to purchase tickets. Basically it will be obvious where the fan pre-sale drop down is once the little red boxes against the tour dates turn green. I am in Australia, I have a pal who is in the UK and he is saying the little red boxes against each date are still red, but we thought they may be doing a timed release to stop the site from crashing. It pays to be a fan! Got tickets for the 12th September. got front row seats for the final night! Thanks Kate for giving us first dibs – it’s a truly Noble & Brite thing to do and we love ya for it. I’m so excited!! Got my tickets this morning, apart from one glitch all ok, but all done. Kudos for Kate for looking after her fans with the pre-sale and doing her best to make sure that fans get a fiar go. So excited! I booked my ticket during the pre-sale! I’ll be there on Sept. 2 in the stalls down near the front. It truly hasn’t sunk in that I will be seeing Kate live. A 30+ year dream realized. I hope everyone got a ticket and gets to see her during the residency. It’s going to be one big WOW! but yes… I was literally shaking with worry! I have the biggest goofy grin now. Off to see the August shows, great seats… It was only the shortest time ago I would have laughed at anyone who asked me when the next KaTe Konsert would be on. Now I’m making plans to fly around the world!! I get to see her LIVE in concert!! OMFG!!! Only need to sort out the little details of flights, accommodation, passports… after the pressure of getting tickets that’s nothing. Hmmm I suppose I need to tell work I’m taking some time off too. Sorry about my earlier comment. I just couldn’t contain myself. I’m so happy and lucky, I just can’t believe it – but I’m also sorry for those who can’t get tickets. I nearly took a heart attack (seriously!) at the computer – about 10am – thinking I’d blown it. Thank you Kate – for giving us that early head start. No one has had more of an effect on me. No one comes close…… love you. After a very stressful morning I now have a ticket!!!!!!!!!!!!!!!!!!!!! I cannot believe that I have a ticket!!!!!!!!!!!!!!!!!!!!!!!!!!!!!!!!!!!!!!!!!!! I saw her at the Hammersmith Odeon, 13th May 1979 and now I am going to see her at the Eventim Apollo on 2nd September 2014!!!!!!!!!!!!!!!! I can now relax and think what could she perform? From the title “Before the Dawn” it could be the Aerial suite, it could be the 9th wave as they are both associated with the dawn. In fact she could sing the phone book or recite pi; oh yes, she’s done that already!!!! Running up that Hill and Wuthering Heights are definites though! And to think, I’ll be in the CORE of Kate’s fandom! Very soon, very soon! Never in my life have I ever been WITH a group of fans let alone thousands!!! I’m over the moon thinking about this! Aside from seeing in-the-flesh a living wonder, I’m going to be meeting like-minded people and sharing (I’m sure) very similar stories about how she’s utterly inspired our lives! That thought ran through my mind today too- it will be wonderful being in a room of people who all love Kate. Wow is she in for a treat when she walks on stage to our warm reception! I quietly weep with my ticket confirmation email now received……..it nearly went all wrong but a change of dates and all went fine. Scary stuff with the codes I can say.. . and only 6 or 7 mins to checkout and pay. It’s over now, much much much (etc) happiness and relief. Count the days, but live them – don’t wish them away. Much love to all. but i’ll change my mind in 5 minutes of course and want the whole of 50 Words, wait til you see…. I didn’t succeed in getting tickets in the pre-sale despite my code and all that. The procedure was indeed a nightmare and I didn’t get enough time to cope with that. I’ll refrain from any further attempt. I am very disappointed (to put it mildly), but nevertheless: I wish everyone with tickets a hell of a good time. Cant belive Kate has been criticised over lost at sea poster.Clearly people unfamiliar with the 9th wave concept on Hounds of Love album written in 1986 ! Strange phenomenon indeed. Kate, we are coming to see you: me, my partner and our friend Jan. I am thrilled that we could buy via the pre-sale. So many moments of pleasure !!!!!!! If someone had told me only a couple of weeks ago that Kate Bush was about to annonce a series of concerts I would have simply laugh. . . How strange (though difficult) it was this morning to actually be buying tickets for a Kate Bush concert!!!! But it was a wonderful sensation. I’d never though this ‘tour time’ would happen again at all. And now we even have more dates added!!! I got my ticket for September 9! I didn’t even think about picking a seat myself – I was so worried about getting through quickly in case the tix would be gone. I just picked a price and let the computer assign my seat. I’m toward the back corner of the Circle section, which might be pretty far from the stage, but I’m still gonna love it! I too have seat toward the back of the circle in the corner and having been at the Odeon before; I was there in 1979 it doesn’t particularly bother me. The important thing is that we will be there!!! I don’t understand all the problems with ticketing procedure as I logged on (via the link) seconds after 9:30 and sailed through the process, left seating to ‘best available’ and got good seats (didn’t want to risk wasting time with choosing seats myself with the clock ticking) still can’t quite believe I got tickets and that this is actually going to happen after sooooo many years of waiting…. Looking forward to seeing you all there!!!! I got my tickets in the pre sale this morning, 3rd September, 9 rows from the front! Very excited. The process was relatively painless as well, although I was shaking like a leaf! Good luck to everyone buying tickets on Friday. Ever since I was a kid I’ve dreamt of this, as the first ever single I bought was by Kate Bush and her music had a major impact on my life. My other half and I have speculated for years that Kate might do a one off concert at some point and what we might do to get tickets and…here we are, tickets for the first night!!! I am literally beside myself with excitement. I hope and wish that all true fans are able to see Kate at what is bound to be an amazing residency and that everyone’s dreams come true. I also hope that she won’t leave it so long next time! This morning was more nerve-wracking than driving test/ getting married/Ofsted! Do you think it’s a better option to go for the “new” dates on Friday? Are all the other tickets gone with the pre-sale codes already?? I am literally crying here in Sweden… I HAVE to get one of those tickets tomorrow! Oh, the agony! Kate – I have tickets for your Wednesday 3rd September show – so I’m already gonna die a happy man – but – any chance you could sing Warm and Soothing? You only have to sing it the one night (if you like) – mind you – there is the chance I may emotionally combust and end up a blubbing, gibbering wreck – but I’ll take that chance. Think about it. it´s one of my favs from the early period too, but I doubt very much that shes about to do it. Like all her music – utterly f***ing beautiful – beautiful beyond belief – ‘… and I’m afraid by the way we grow old…..’ – still makes me cry – every single time – 34 years on. And thank God for that. Hello everyone. This is my first comment in this website. I must confess I have been no frequent visitor here, from time to time actually. Thank you very much all the staffs for all the informations through the years. Thank you everyone for sharing what’s in your mind. With no intention to figure out who is bigger fan and who is not (which I really don’t like to), I hope all the people who should get ticket because of her/his supports on Kate get ticket, as it seems there are some such people who must have been supporting her more than I. What I have seen since last Friday makes me feel that Kate has no need to do promotion which may mean she has no need to prepare seats for mass medias. How nice the venue would be filled with fans. To be honest, since I bought ticket I have not found myself get excited. Unbelievably emotionless. I think I understand what it may make me end up with, but maybe some part of me are not working. Or instinctively I might doubt if it’s really going to be happened more strongly than my emotion. 5 rows from the front…….pinch me am i dreaming! I did it. I remained calm even when the credit card declined. Just picked up the backup card and entered. Up in the circle ….. can there really be a bad seat in the house when Kate is singing ? tears everytime I think about it !!! !